INDUSTRIAL real estate partners registers all industrial and logistics real estate transactions as of 5.000 sq. m. All data will be analysed and processed to an high-end research report which is made in close cooperation with Bak Property Research. All relevant information on take up, available supply, stock numbers, land prices, developments of rents and realized gross yields are clearly displayed in our report. The take-up of logistics properties in The Netherlands has once more broken a record in 2018. At 2.3 million square meter, take-up was 9 percent above the level of previous record year 2017. The investment market grew even more. 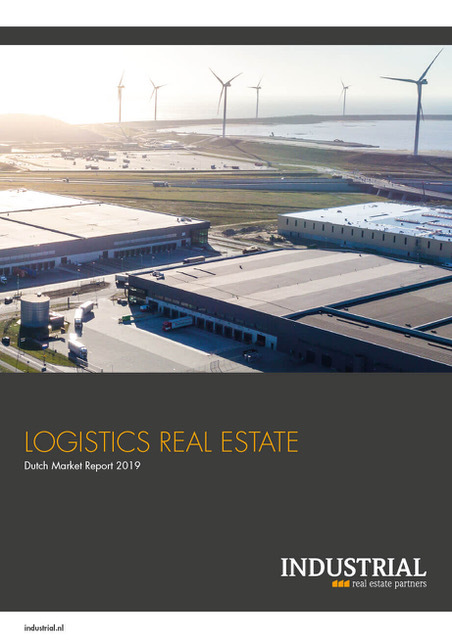 This is the conclusion of INDUSTRIAL real estate partners’ most recent research report, “LOGISTICS REAL ESTATE, Dutch Market Report 2019”. The agency firm, with 3 offices in the Netherlands the only real estate advisor specialized exclusively in logistics and industrial real estate, annually registers all occupier and investment transaction from 5,000 square meters, in co-operation with Bak Property Research.